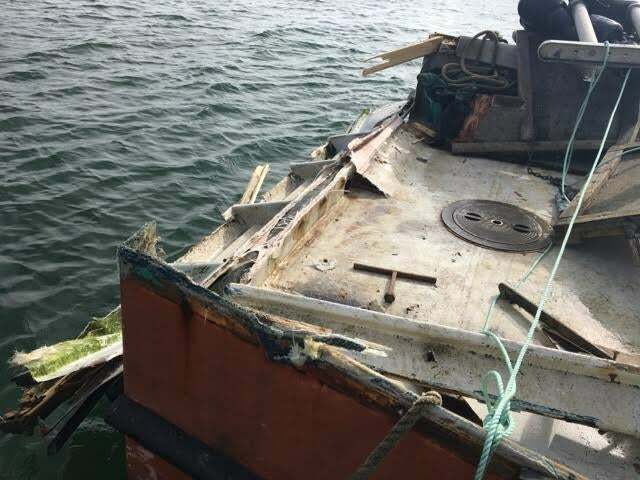 The Great Pumpkin, a commercial fishing vessel, suffered some damage after colliding with another boat off the coast of Chatham on Saturday. Seven people were rescued from a sinking boat Saturday morning after it collided with another vessel off the coast of Chatham on Cape Cod, officials said. The 38-foot charter fishing boat and a 40-foot commercial fishing vessel crashed at 6:20 a.m., sending the charter fishing boat — the Artemis II — 90 feet down to the bottom of the ocean, US Coast Guard Lieutenant John Mansolillo said. The vessels were about 7 miles southeast of Chatham, he said. One of the seven Artemis II passengers fell into the water during the collision, but all seven were rescued by the three-person crew on the commercial fishing vessel, the Great Pumpkin, Mansolillo said. No one was injured. The Artemis II was also carrying about 400 gallons of diesel on board, but no spills were reported, Mansolillo said. The cause of the collision is still under investigation, he said, adding that the weather was “very foggy” at the time. Neither vessel has received a citation for violating Coast Guard regulations, he said.